Pro football doesn’t do all that much for me. But I just had this nagging feeling that the championship games were worth watching this year. And boy, was I right. After all, the Tom vs. Eli PR machine was in high gear. So, I sat down with a friend, a bowl of chips and salsa, carrots and dip, turkey sandwiches, a little wine and 60 inches of testosterone HD-style. Big games deserve a big screen. When the Ravens’ Billy Cundiff hooked his field-goal attempt that would have had them flying to Indy, I was heartsick. Not that I’m necessarily a Baltimore fan, but because I thought no one could feel any crummier at that moment than him. What happened in the locker room after that major miss? Did his teammates slap his pads and say good try or did they just slug him? Next game – Eli was no bologna when he overcame six sacks in his record fifth playoff win. And nothing like overtime to crack out some IPA beer and Ben & Jerry’s chocolate cookie cake-something in my perfect woman cave. This time a foot made the difference. Lawrence Tynes’ foot that is. He booted the football up and over to clinch the 20-17 win with a field goal, taking advantage of San Francisco’s Kyle Williams’ fumbled punt (say that 10 times fast). Just like the millions of other people watching the Big Game, I can’t wait, even if I am most excited about the commercials. Let’s see what Bud, Coors, Doritos and Snickers are up to this year. Speaking of the Big Game, zcomm has a big contest. We want to know what it is about the game that reels you in. Is it the commercials? The viewing parties? The out-of-bounds food? Or maybe you’re rooting for your home team! Comment below and let us know what you’re most excited about, and we’ll choose one lucky fan at random to win a Big Game Party Pack! It’s almost game time, so hurry up and enter for a chance to win. This contest ends Thursday, Feb 2 at 3 p.m. ET. I was into the commercials when they were just good…even before the commercials were so completely and competitively cult-following cool! Snackies and the commercials. There is always a gem or two in the commercials. Im excited to see my New York Giants win their 4th Super Bowl in Franchise History. GO BIG BLUE!!! I watch it pretty much just because everyone else does, so I’m not left out of conversations the Monday after. Watching tom brady cry because he loses to the giants yet again in the superbowl. The commercials are always interesting, but I really enjoy watching the halfime show. Especially when some of my favorite artists (like Madonna this year) are performing! Other than that, it is always interesting to see the fanfare and excitement surrounding the game. It reminds me of a a giant celebration, with a football game to top it off. Oh yeah, the Lombardi Trophy is at stake too….. another great reason to tune in! Go Pats! I watch the superbowl because i am an avid football fan, and also like the commercials. This year I am also watching because the Giants are playing. Cruz’s end zone salsa dance! Gotta be the commercials, that’s when every advertiser has to step up their game. Although I don’t really think they have much effect on a person’s decision, they do gain quite the appeal if their video is popular enough on youtube after the game. I’m not terribly excited about the halftime show though, not ever since Janet Jackson ruined it for everyone. yayy commercials and tons of snacks! Because it’s just the biggest event in sports- regardless of the teams. There is no bigger marketing event in our country. Plus football rules. I watch the Super Bowl for the 2% chance I’ll see a spontaneous celebrity TD at the halftime show. Everyone knows that the real excitement can be found at the Puppy Bowl VIII and Kitty Half Time Show on Animal Planet. Those players are even cuter than Tom and Eli. Since the Ravens are out I’ll only watch it for the half time show. The Super Bowl is one of the best times of year! Everyone gets together and has a good time! It’s an excuse to have a party! I watch the Super Bowl because I like football and enjoy the commercials, except this year I hate both teams!! I watch the Super Bowl for the moment Victor Cruz makes a TD and can do his salsa dance in the endzone at the biggest game of the year. I watch because who doesn’t love an occasion with food, family, football, and beer. I watch the Super Bowl to have a reason to party and get rowdy on a Sunday afternoon. Unfortunately I hate both teams this year! I watch the superbowl because I love football and everything else involved. This includes the food, beer, commercials, the half-time show, and spending time with friends. I watch because I love football and it is typically the two best teams, which makes for a great game! I like to see how quickly they can change the set from a football field to a rock concert and then back again – all in a matter of minutes while we watch some awesome commercials. My excitement is for the food, the beer, and a good game! I watch it because I’m a newbie at this football stuff. I’m still trying to learn the game but I do love to watch it! And of course the commercials, they are hysterical ! My excitement is all about making and eating the food and the commercials (both good and bad). Eating ridiculous amounts of food, screaming at the TV with friends and family, and laughing a whole bunch is what reels me into watching every single year! This year I’m muting the game and turning the volume up on the commercials. 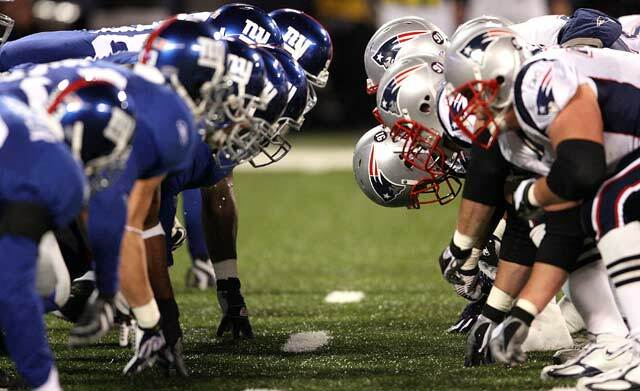 We all want to have a superbowl party so we can eat and drink ourselves into oblivion, but who really wants to see another Giants Pats superbowl? Also I’m 7-3 in the pool. I watch it because I love the game of football and it is such an anticipated event that everyone looks forward to. And of course there is always a party involved! I’m going to watch it because my roomate decided that he wanted to have people over. My only other option is to play Call of Duty alone in my room. I like doing man things. I make my own beef jerkey, go on riverboat gambling trips, and watch the Superbowl. I watch the Super Bowl bc chicks dig guys that are into sports. This Big Game contest is now closed. Thank you to everyone for entering! The winner will be announced shortly.